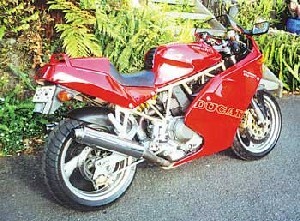 In February of 2002 I got my arse into gear after much talk and bought myself a GPX250. After 10 months of riding I'd been getting well frustrated with the lack of power of the GPX so sorted out some money, talked to loads of other folks and bought myself a Ducati 600ss. 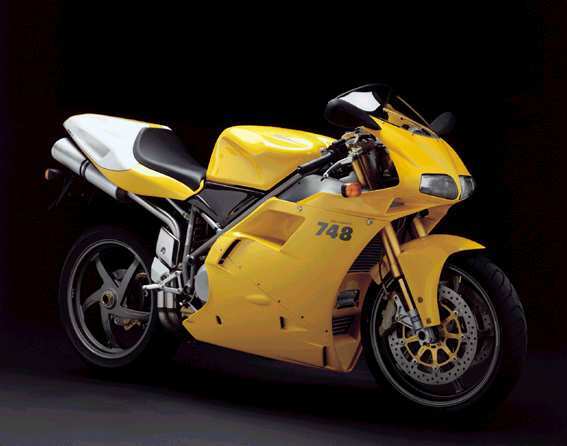 Notes: The 600 SuperSport shares much of the same componentry as its larger 750 and 900 siblings. It only has a single front-disk which so far seems to be doing the trick, and apart from a few details its basically the same machine (minus a few HP :-). When I'd been considering what to buy next I was looking principally at 600 fours as a stepping stone to something larger in a year or so. Some of the newer fours I woz looking at are actually pretty grunty on the HP front and after talking with a few twin owners I was definitely starting to have a few doubts about the inline-four format as a next-bike step. 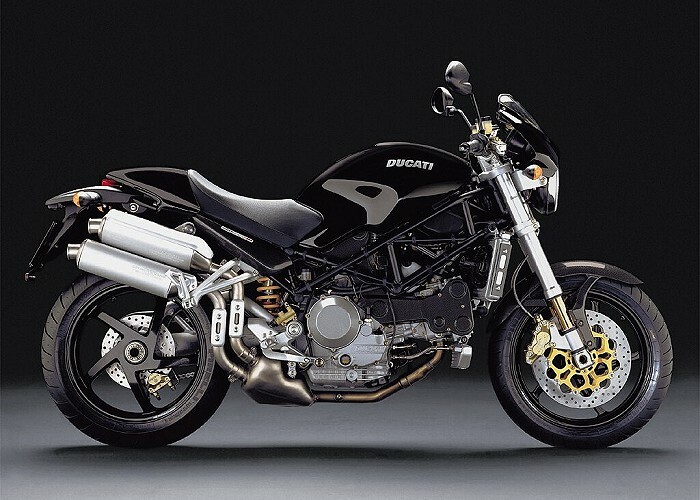 One of my workmates had owned seven Dukes .. 600ss, 900ss, 748, 996sps, Monster S4R, 748R and finally a 998S, so he's hardly lacking in the bias stakes but I really liked the sound of his beast, and other twins I'd been and seen around. Plus the more torquey nature of them (vs the peak-ier 4's) seemed to be the kind of thing I was looking for riding-style-wise. I bought the 600 off a friend of a girl at work. 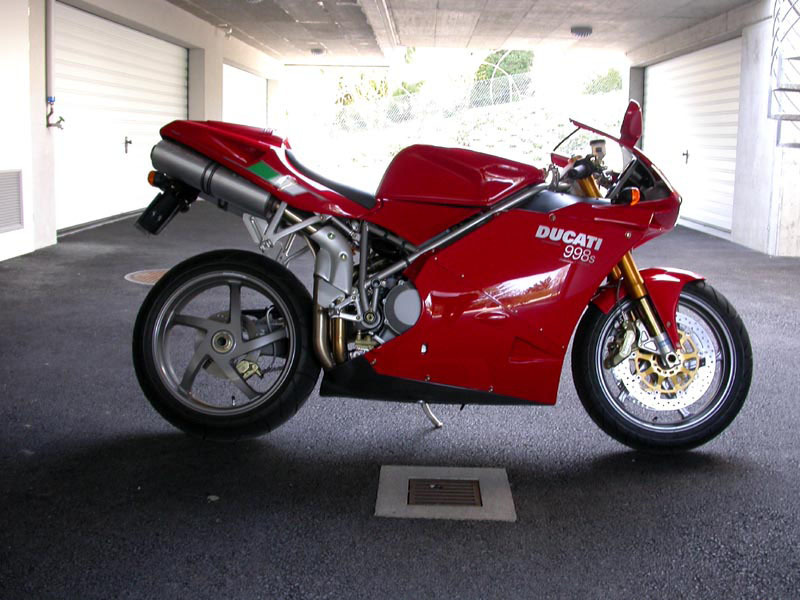 It was in great condition, had done 40K when I bought it and I put about 10K on it stropping round the local country roads I'd been thrashing on my old GPX over the previous year. The machine turned out to be a fantastic stepping stone. 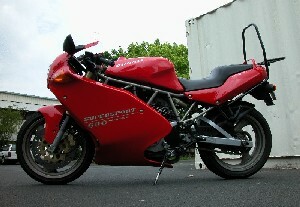 Was wicked to learn on as a mid-capacity bike, more power and different handling. It's a dream in the traffic when U need to get past slower vehicles, and was bloody liberating to have a few extra horses when you need it out of a corner or when climbing a hill. Kym was pleased when I bought it (despite being 6 months away from being licensed) coz in the evenings I was giving her more attention than the motorbike trade mags. She wasnt too sure how long that was gonna last though, and as it turned out, it was about 6 months before I started buying trade-mags again, and another 6 months till I bought my next bike, a Kwaka ZX7R. Kym is pleased again.